This wonderful recording was made at the Deep End Ranch in Southern California, north of Los Angeles. Jesse is the son of West Virginia musician and folklorist, Gerry Milnes. Emily also has strong musical roots; in fact, I reviewed a great recording of her with her mother, Valerie Mindel, a few years ago. Emily is lead singer and a fiddler in the Sweetback Sisters. They have been playing together as a duo for about a decade and that shows in how well they work together. Both sing, both fiddle, and both play guitar, all very, very well. This generous collection of 17 tunes and songs opens with Jesse fiddling and both singing Fun's All Over. Next, Jesse fiddles Puncheon Floor from Murrell Hamrick. They switch instruments, and sing Roving Gambler. They switch back and switch lead and harmony vocals on Hazel Dickens' My Better Years. Another vocal switch and it's on to Come All You Roving Gamblers. Then Emily fiddles Fine Times at Our House from Edden and Burl Hammons, and Jesse fiddles The Big Fish, a version of Ryestraw which he learned from Melvin Wine, his father, and Ernie Carpenter. Emily wrote I Got Lucky With You for their wedding. Then she sings Ola Belle Reed's Undone in Sorrow. Jesse learned the song Hiram Herbert from two West Virginia friends who, in turn, learned it from Currence Hammonds and Maggie Hammons Parker. Jesse learned Yellow Barber from Dave Bing, but it is also played by many Kentucky fiddlers. His version of No Corn on Tygart comes from Ed Haley. 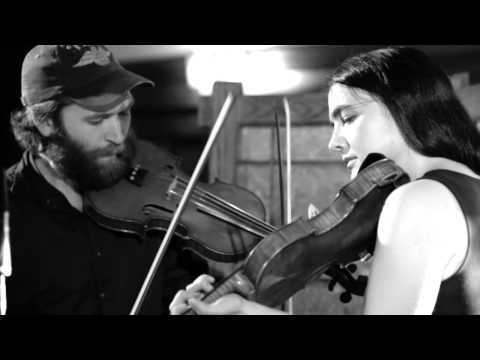 Jesse learned Sally Anne Johnson from a Clark Kessenger recording, and they double fiddle it. Emily sings a solo a capella version of Hungry Faint and Poor from Addie Graham. Next, Jesse plays Angeline the Baker as a guitar solo. Then another double fiddle number, Woody's Waltz, named after Woody Simmons, who played it. The CD closes with Jesse's original song about Emily, My Baby's Not a Nightowl. I had heard a cut from this CD before I received it to review, and it exceeds all expectations. This couple is so obviously comfortable together, both are highly skilled players and singers, and they have great material. This is a must have for fans of old-time music.